On your wedding day, everyone is there for the sole purpose of celebrating your exciting new journey in life. You’re in love and ready to share it with the world. It’s an incredible experience that is only made better by having a talented team make it a party. Wedding Masters Vegas brings energy, entertainment, and a spirit of celebration to your event and we do so by knowing what you want and expect. Every entertainment company wants to have your business but at Wedding Masters Vegas we want to earn it. We’re excited to answer your inquiries, take your calls, and find a time to talk with you. That’s how we learn about your ideas and ask thoughtful questions to help you create something incredible for your special day. We have a hands on approach to help you find that ideal blend that works with what you have envisioned and help you master one of the most exciting parts of your wedding—the entertainment. Plus, our planning system helps ensure we are all working together toward the best wedding day celebration. The moment this day is all about… your “I do’s.” Whether your vision includes the classical strings of Pachelbel’s Canon in D, or the contemporary sounds of your favorite of today’s artists, your selections will forever be part of the memory of your wedding day. Knowing what you need is an essential part of putting your ceremony soundtrack together. Wedding ceremony music can be viewed in four parts – preludes, processionals, recessionals and interludes. • Prelude: Sets the ambiance as guests arrive and are seated. • Processional: Accompanies the entrance of your family, bridal party and you, the bride. • Recessional: Plays as you exit as Mr. and Mrs. at the conclusion of your ceremony. • Interlude: Music to accompany significant moments, like your unity ceremony (unity candle, sand ceremony, hand fasting, etc). Once you’ve selected the perfect musical accompaniment to those priceless moments, your Wedding Masters Vegas DJ will work with your celebrant to perfectly orchestrate your wedding ceremony. Your wedding ceremony will go off without a hitch! Call or email today for an appointment to discuss your ceremony details. When you think of your wedding DJ, chances are you’re imaging a packed dance floor filled with your nearest and dearest rocking the night away. We agree and we’ll do that for you. Something you probably haven’t thought about though are the formal parts of your wedding reception. 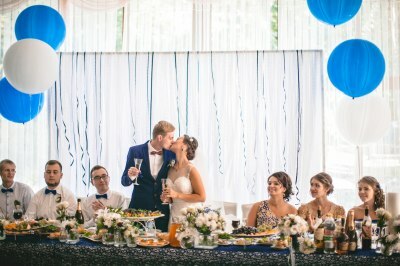 We’ll guide you through the coordination of all those special wedding moments, like your grand introductions, toasts and speeches, cake cutting and your first dance. Remember, there are a few hours of activity before you get to the dance floor, and our experienced Master of Ceremonies will lead the way. It also works to your benefit that Wedding Masters Vegas wedding DJ’s come from a club background. Your DJ’s training as club DJ’s makes them pros at mixing your music selections, reading your crowd and knowing what works to keep the dance floor full. They’re experienced with playing the right music to please all of the different age ranges and music preferences of your guests. The sights and sounds of your wedding reception will create your guest’s experience. Your guests will have the time of their lives as your Wedding Masters Vegas wedding DJ provides the ambiance that breathes life into the plans you have spent so long creating.